Raw Talent: Fourteen-year-old Paisley loves to sing. She dreams of being a pop star just like her idol, Denzi, who also grew up in the small town of Stonehill. The problem is, Paisley suffers from severe stage fright. She can only sing in private. When word gets out that a famous Stratford actor who has worked with Denzi is staying at a local B&B, Paisley decides it’s time to face her fears. She convinces the actor to tutor her and signs up to sing in a high-profile fundraiser. In a way I’ve been researching this book forever. Like Paisley, I have a low singing voice that doesn’t fit into the usual female parts of soprano or alto. Because of that, I grew up thinking I couldn’t sing. Now, many years later, although I’m definitely not a soloist, I’ve sung in a competitive a cappella chorus and in many community choirs. I love being onstage, but I’ve met so many people who are far better singers than me, but who don’t enjoy performing in public because they have stage fright. I’ve had a lot of group vocal coaching, so I’ve used what I learned over the years to show how a young girl could overcome her fears and make her unique voice work for her. Who would you want to play your protagonist in a movie? Maisy Stella, who plays Daphne on Nashville, would be perfect to play Paisley in a movie, as would Victoria Anthony, the girl who sang with Pink at her recent Vancouver concert. What is the most challenging part of being a writer? The most challenging part of writing for me is producing a first draft. These days I plan a lot more than I used to, but even when I’ve developed characters and figured out major plot points, putting the words down on a blank page is a struggle. What I’ve learned to do is focus on the dialogue in a scene to get started, then go back later to fill in the setting and description. After that, I love revising, because I have something to work with. 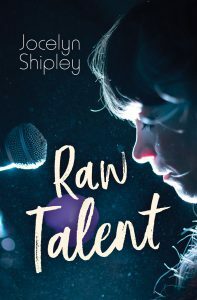 Raw Talent is available now! Jocelyn Shipley has written several books for teens, including Impossible and Shatterproof. 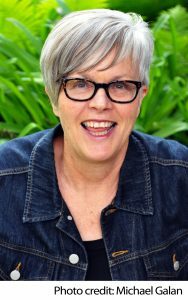 Her award-winning stories have been published in newspapers and anthologies, and her work has been translated into many languages. Jocelyn lives in Toronto, Ontario, and on Vancouver Island. For more information, visit jocelynshipley.com.